Pulling away from the King of Fighters XIII and Persona 4 Arena content, PersonaWorld has been taking to JoJo's Bizarre Adventure All-Star Battle. 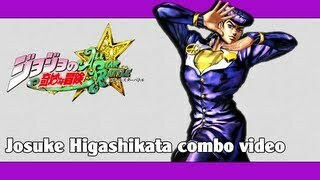 Take a look at some Josuke Higashikata combos inside. PersonaWorld has posted another JoJo's Bizarre Adventure All-Star Battle combo video. The focus here is on Josuke Higashikata. If you missed the uploader's Dio combos, click here.